Home ¬ How to ¬ Configure Maintenance Schedule of an Exchange Mailbox Database? An Exchange mailbox database as one of the most critical email communication platform requires regular maintenance for flawless email transmission between the sender and receiver. However, maintaining an exchange mailbox database while keeping the long-term sustainability intact is not as easy as it seems to be. Everything needs to be planned and scheduled to carry out the maintenance tasks successfully while ensuring efficient operation and smooth functioning of exchange databases. Here are the steps to configure the maintenance schedule in an Exchange mailbox database. Step 1 - Launch the Exchange Management Console and select “Mailbox” under the Organization Configuration” in the left pane. Step 2 – In the database management tab, double click on that particular exchange database that needs maintenance and schedule the maintenance task for it by clicking on the “Maintenance” tab. Enable background database maintenance (24x7 ESE scanning). After you click “Ok”, a database maintenance window will be scheduled that will allow your Exchange server to execute all the important tasks at the specified time. Set-MailboxDatabase -Identity "Exchange\MailboxDatabase" -MaintenanceSchedule "Mon.5:00-Mon.9:00"
This command will run the exchange mailbox maintenance schedule on Monday. Step 4 – To further defragment the exchange database, one can use the “eseutil” tool which is inbuilt in the Exchange server and can be manually configured. However, your Exchange server may have to face a downtime of nearly 5 to 20 minutes per gig of the information store. Keeping in mind the complex and voluminous exchange mailbox databases, it is essential to often perform defragmentation of databases, re-index them and carry out other maintenance tasks in order to execute smooth flow of communication. We hope that by following the above steps would help you to configure the maintenance schedule of an exchange database mailbox. However, when you encounter Exchange corruption or damage in mailbox databases, you may need 3rd party EDB to PST tool that are reliable and smart enough to perform everything without any hassle. 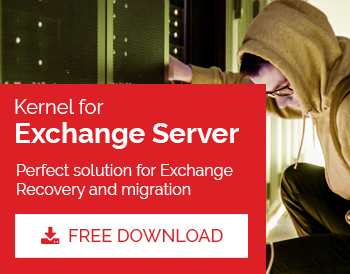 One such tool is Kernel for Exchange Server – an efficient Exchange recovery solution to resolve all the exchange database issues and escape potential errors via complete exchange database restoration.